What do you do when when you wake up and feel a little out of sorts, a bit sad, and can’t quite put your finger on it? It doesn’t happen to me often, but when it does, I try my best to shake myself out of my funk as quick as possible. I can’t keep going through my day feeling blue, especially not when I’m bringing positivity into my life! So what to do? A little self-care is in order. Self-care is an important part of life. I find if I go too long without showing myself a little love, I can get pretty funky. Taking time to take care of yourself is important… if you don’t already do it – start now! 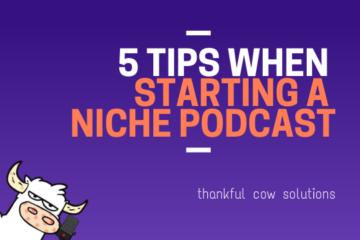 You want to start a podcast but aren't sure if you're doing it the best way? 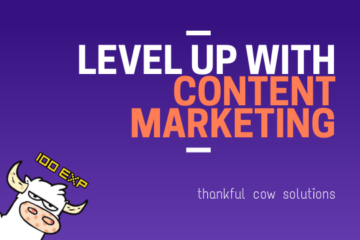 These are the tips Thankful Cow has learned over the past 6 months. 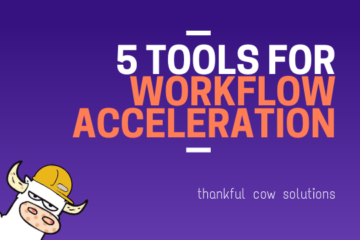 5 tools to help you improve your business' workflow. Better workflow leads to more productive workdays and a healthier work/life balance.